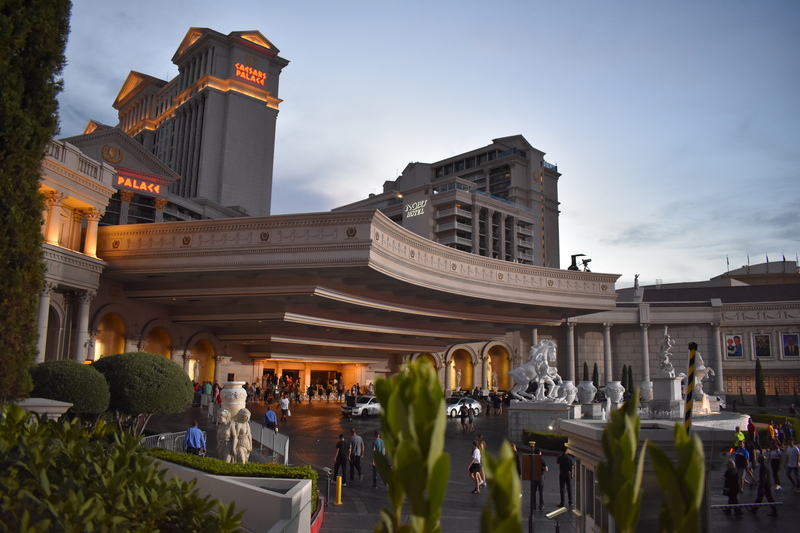 The temperature gauge read 111, and ACDC’s “Highway to Hell” somehow fittingly came on the radio as we rolled into Caesars Palace, smack dab in the middle of the Las Vegas strip. 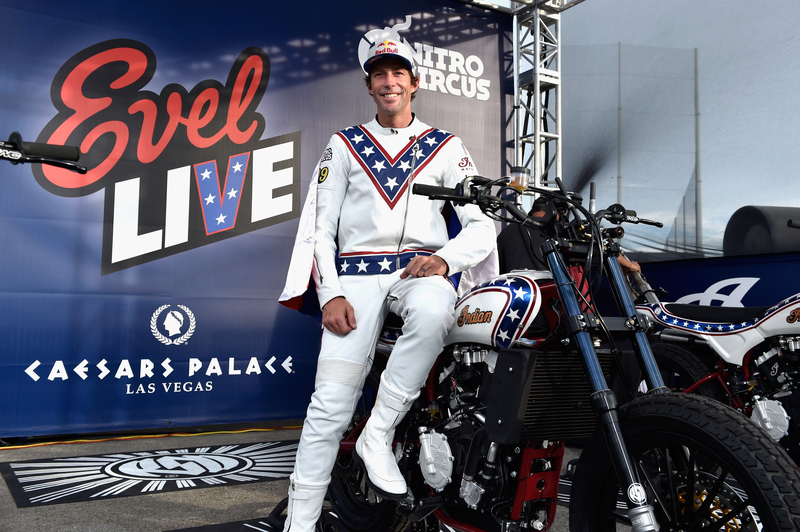 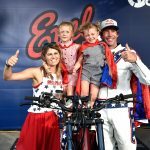 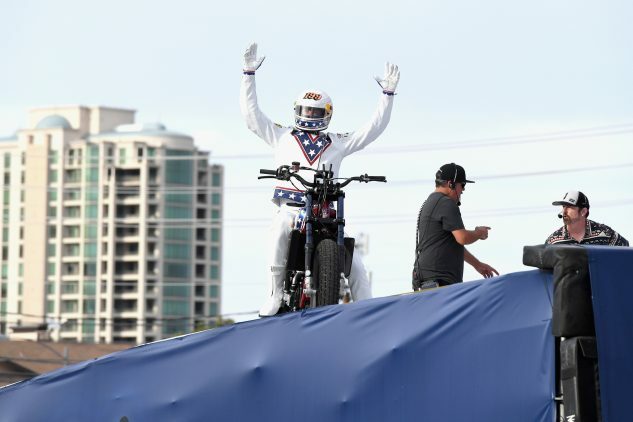 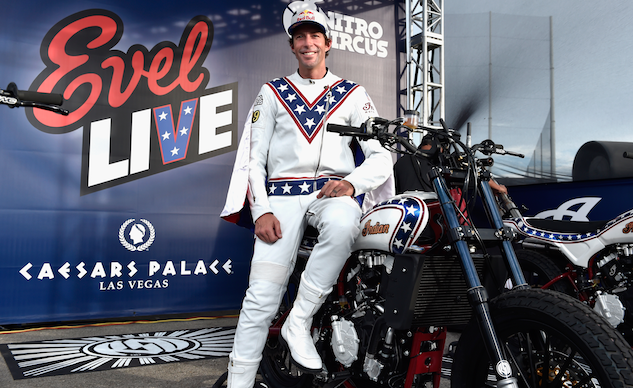 Multiply that by three jumps, and we’ve got the Devil’s number, 666, except daredevil Travis Pastrana wasn’t going to let a little heat stand between him defying the odds and inking his name in the record books next to Evel Knievel’s, yet again. Okay, maybe our math is a little off, but there’s no denying the crazy timing and correlation between it all. 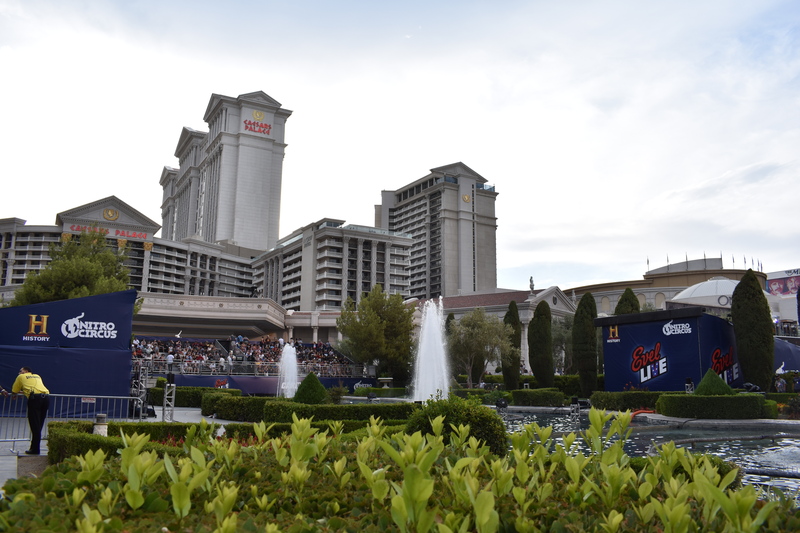 The stage couldn’t have been set any more perfectly for such an epic night that would soon unfold. Nothing like a good ol’ fashioned wheelie or two to get the crowd excited. 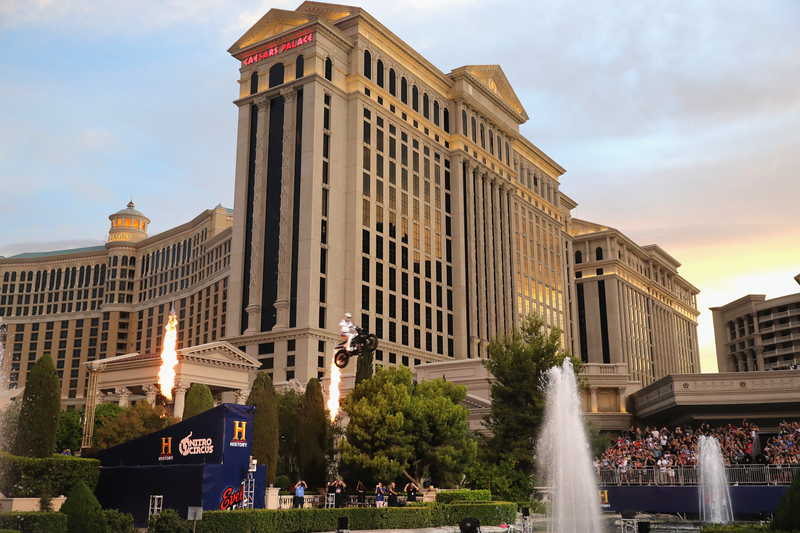 The city was mobbed with people trying to get a view of the spectacle. 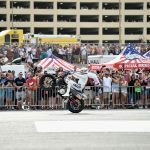 The people in the parking garage behind had a great one! 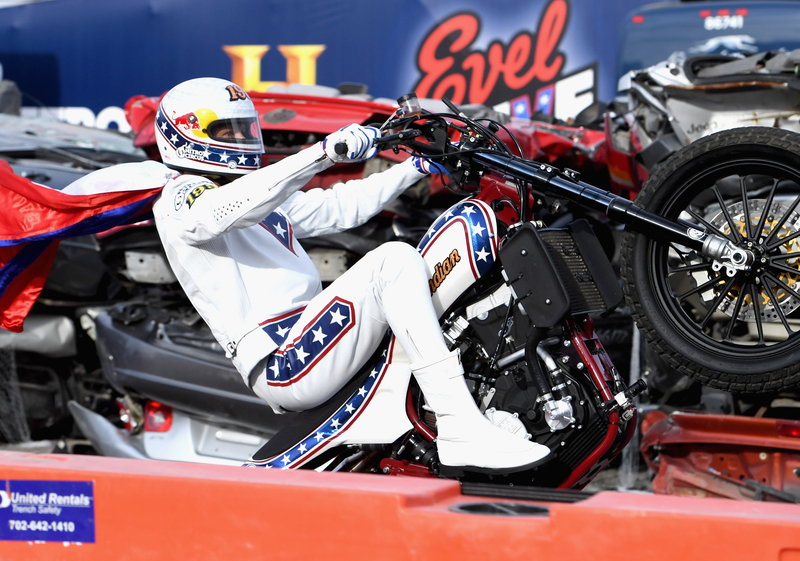 Travis’ mission was simple: to triplicate three of Evel Knievel’s different jumps (and then some) in three hours. 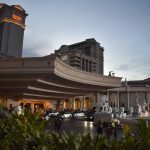 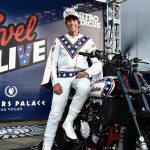 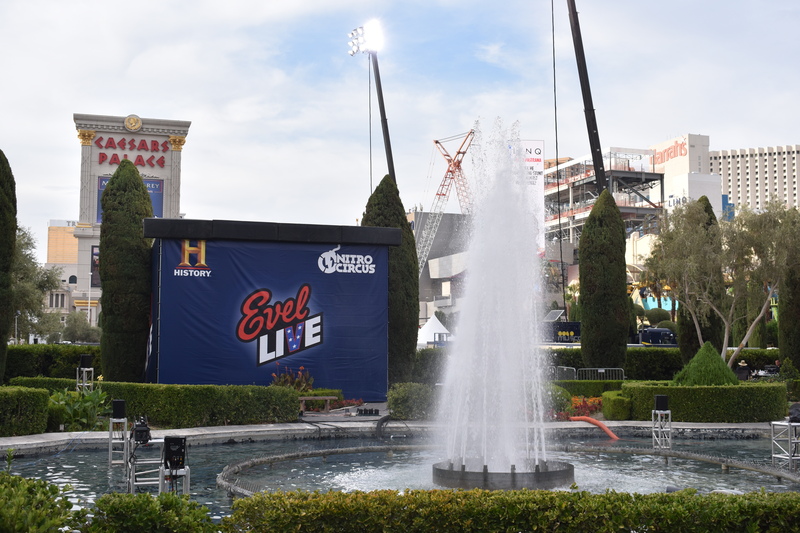 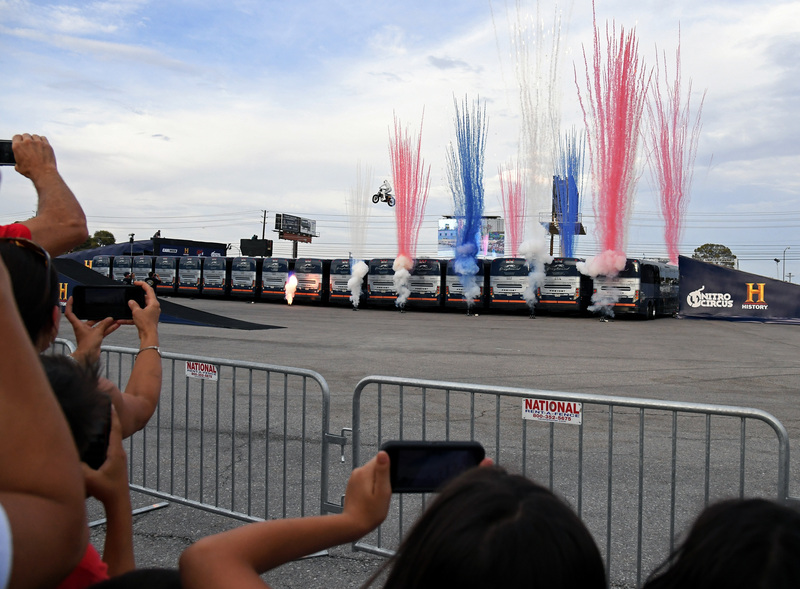 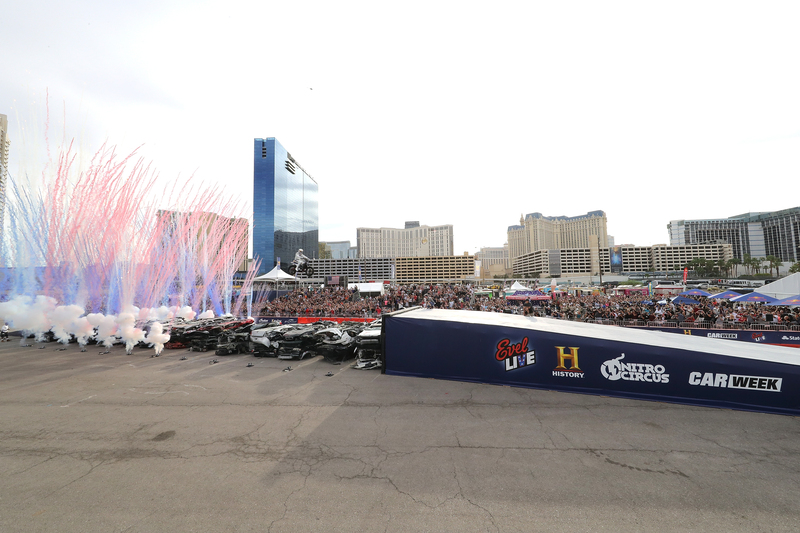 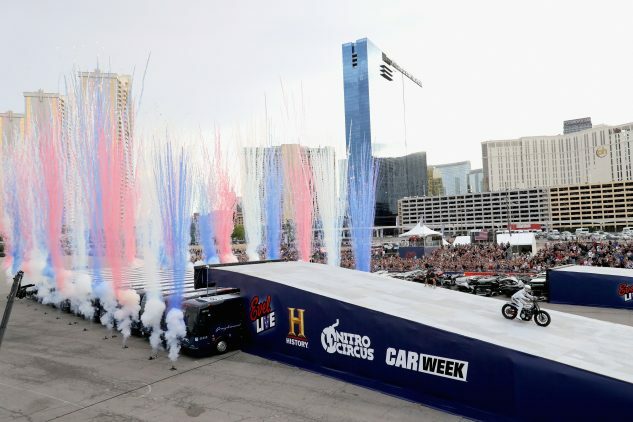 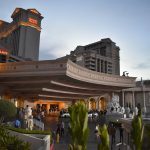 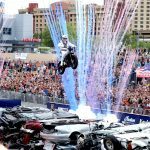 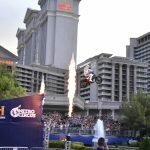 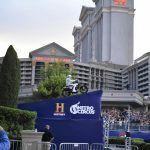 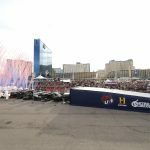 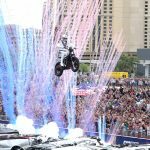 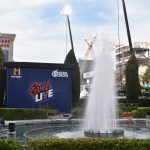 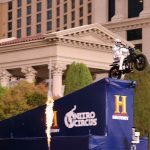 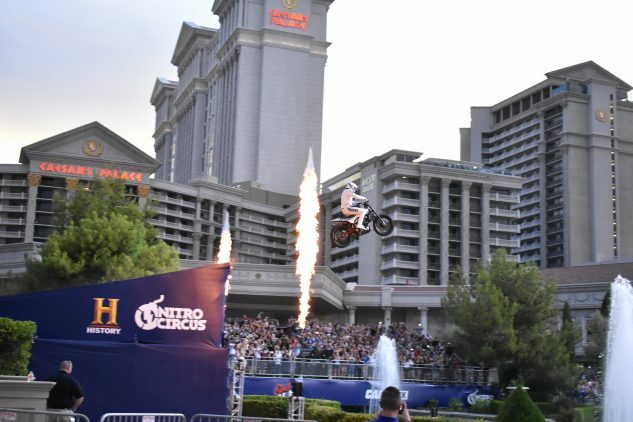 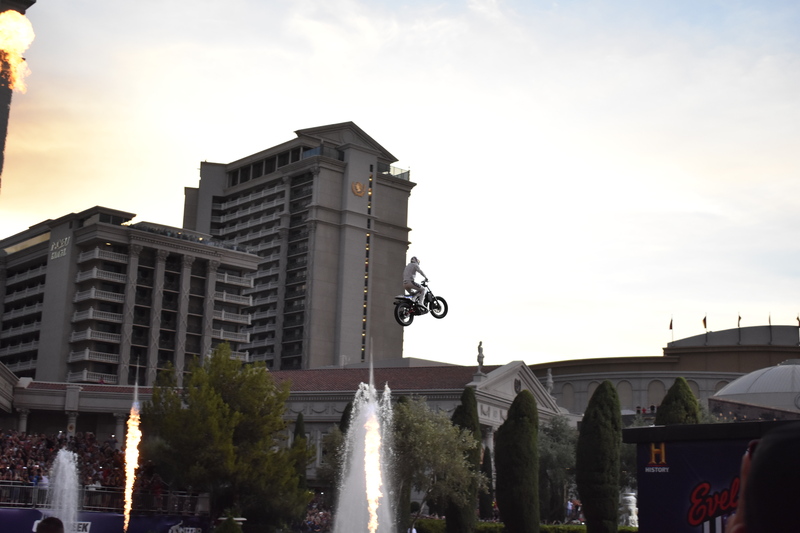 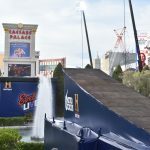 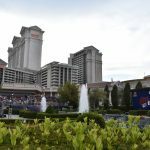 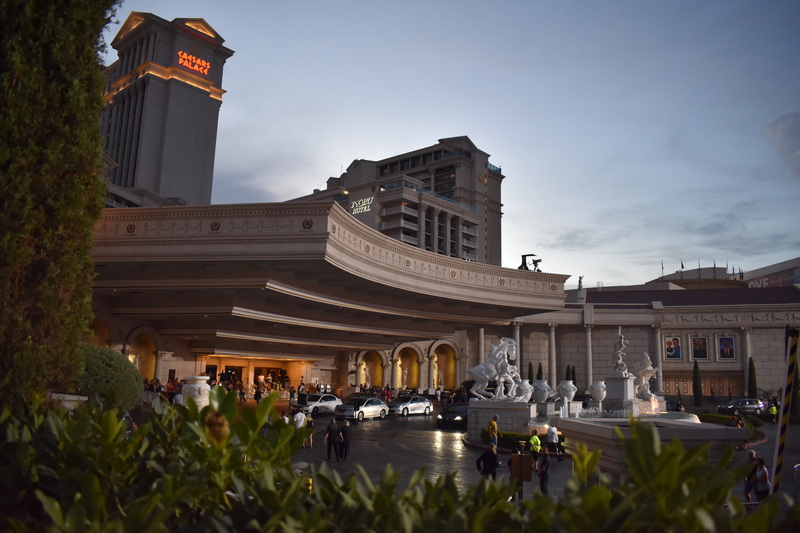 The first would see Travis jump 143 feet over 52 cars (two more than Evel’s 1973 attempt), the second 192-footer saw Travis fly over four stories in the air above 16 Greyhound buses (two more buses than Knievel’s 14 in 1975), and the grand finale, the infamous Caesars Palace fountain jump that nearly took Evel’s life 50 years ago, would see Pastrana soar into the record books high above the Vegas skyline. 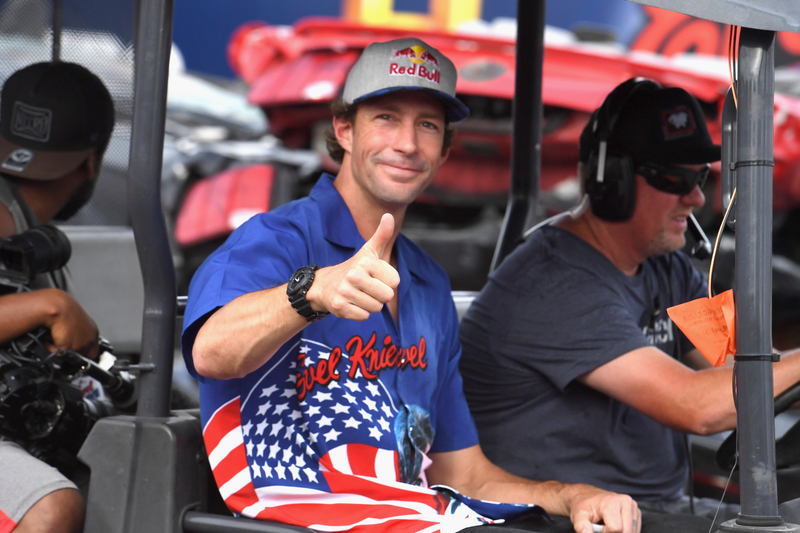 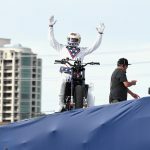 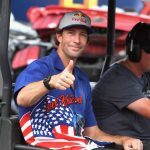 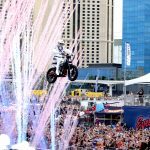 What In The World Is Travis Pastrana Up To Now? 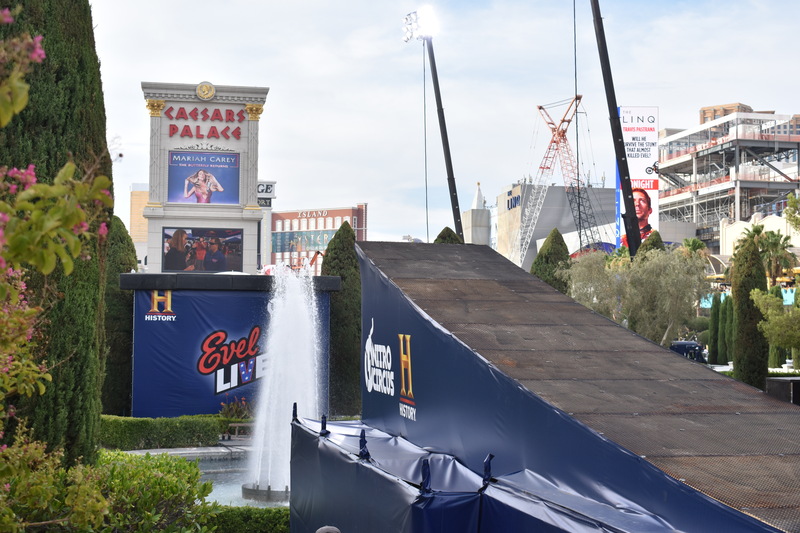 An hour before show time, the temperature was still well above 100 degrees, there was a 60-percent chance of rain, and wind was gusting up around the 35-mph mark – not necessarily ideal conditions to be attempting such feats – but in Travis’ own words, “I wouldn’t have it any other way, and I can’t wait to send the Indian.” Clearly, Travis is no stranger to taking risks, but in his line of work, anything can happen, after all. 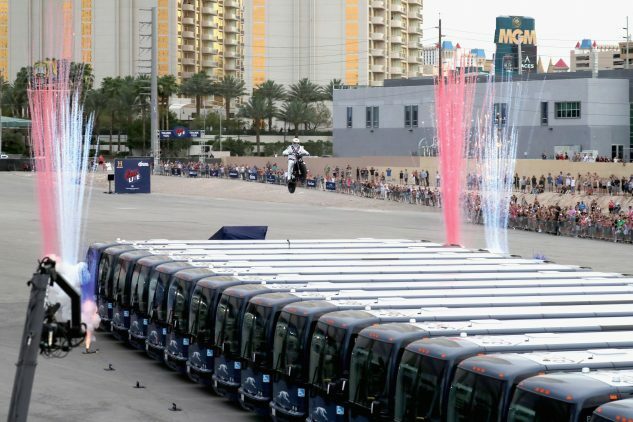 There was certainly an air of tense anticipation as all the spectators held their breath in preparation. 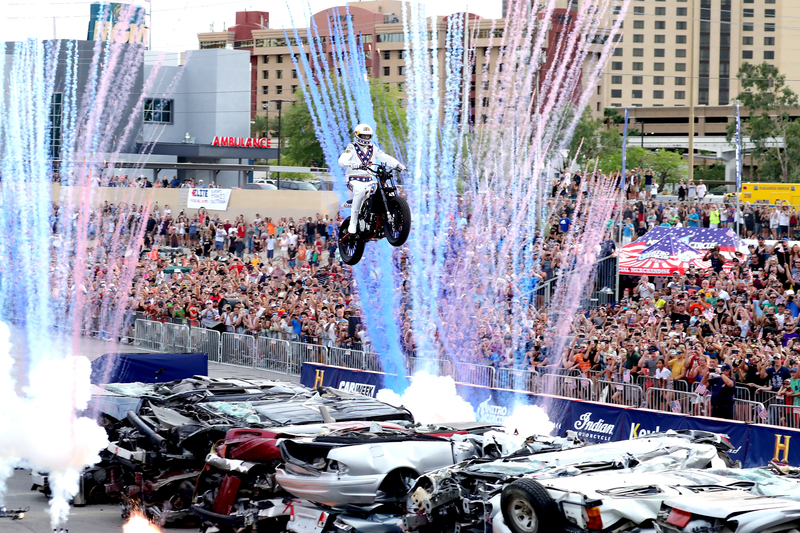 Jump 1 – 52 crushed cars. 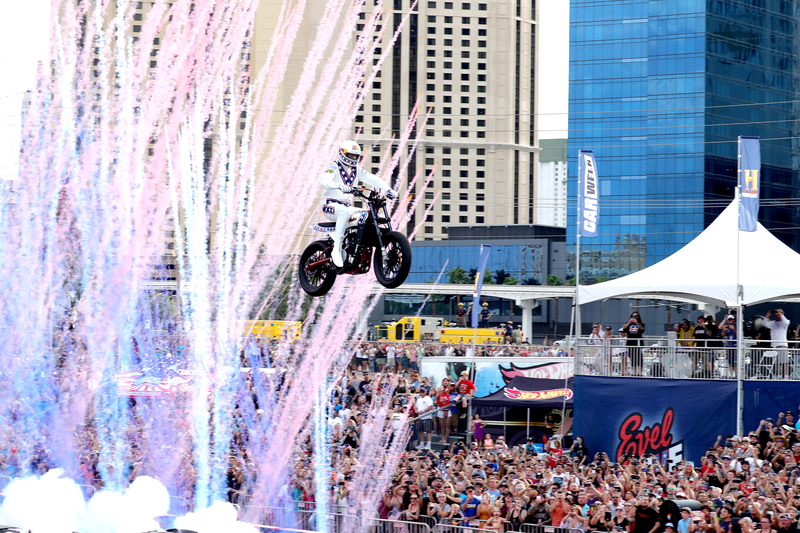 Travis makes it look easy. Jump 2 – 16 Greyhound Buses. 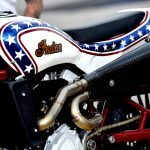 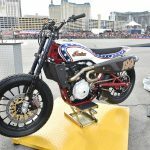 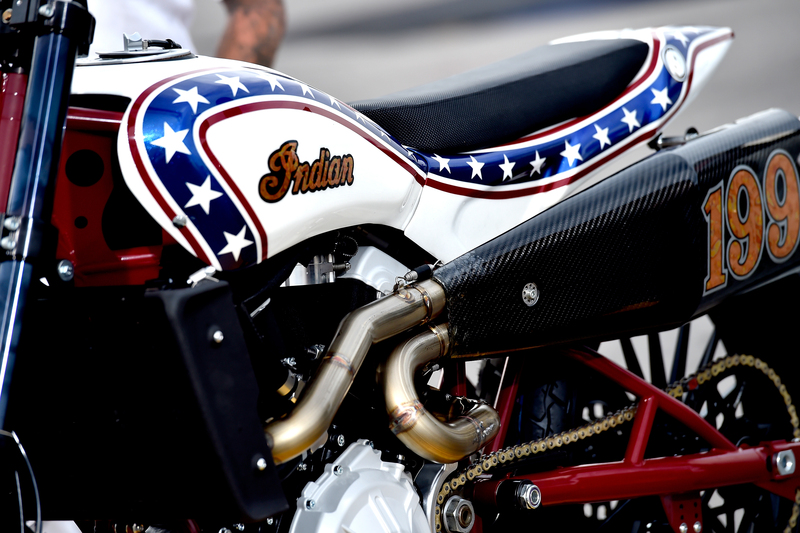 You could hear Travis’ Indian FTR750 roar to life before each of the three jumps as the announcers and crowds came alive with excitement. 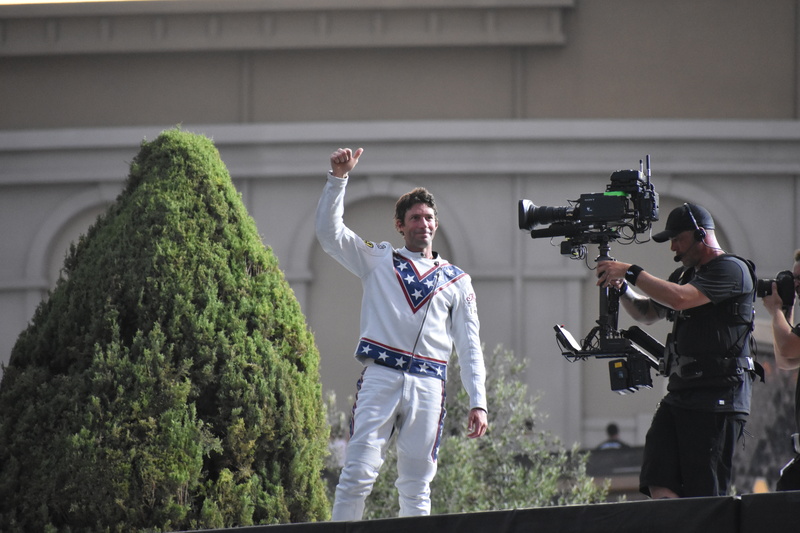 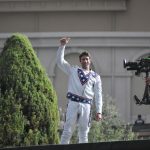 With jumps of this magnitude, and the added pressure of doing it all live in front of over 25,000 spectators and millions of TV viewers, letting your nerves not get the best of you is no easy task, but if there were ever any stunt man to recreate and pay homage to Evel Knievel’s legacy, it’s without a doubt Travis Pastrana. 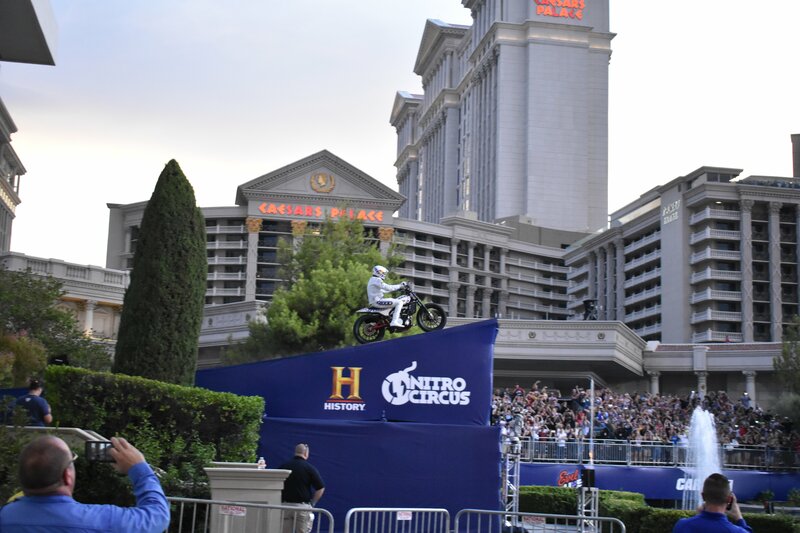 Don’t let the angle fool you, the jump is bigger than it looks. 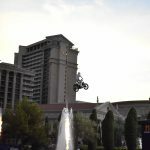 Travis will have to get his 400+ pound Indian FTR750 up to almost 80mph to clear the fountain, and he’s only got about 200 feet of run up to do it. 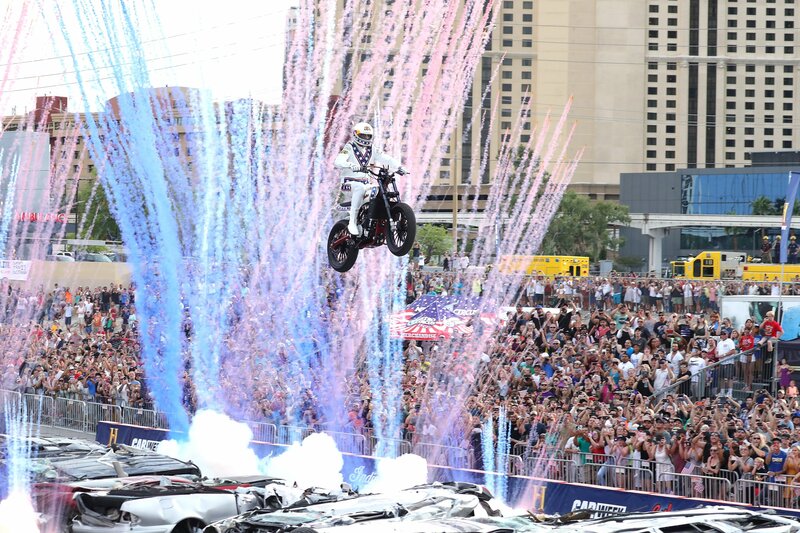 Same goes for the run out of the landing. There’s been a lot of construction in Vegas since Evel attempted it in 1967. 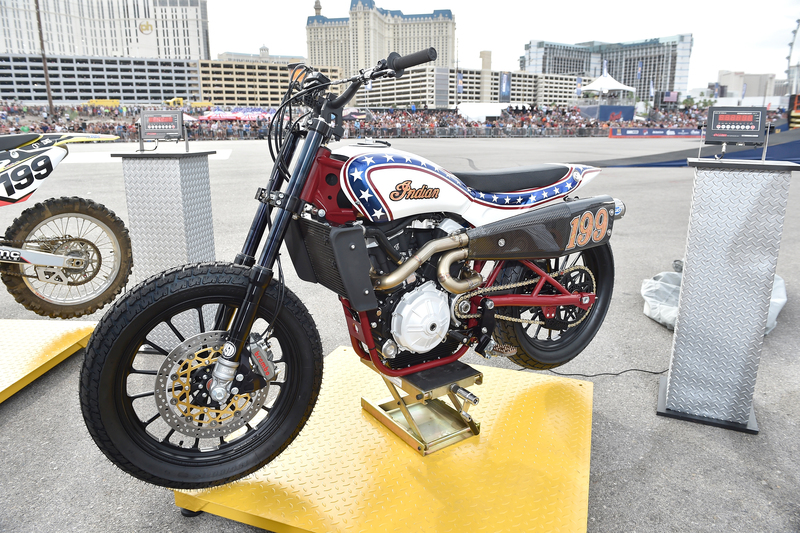 A quick sight inspection and then it’s time for blast off. Captain, engage the thrusters! 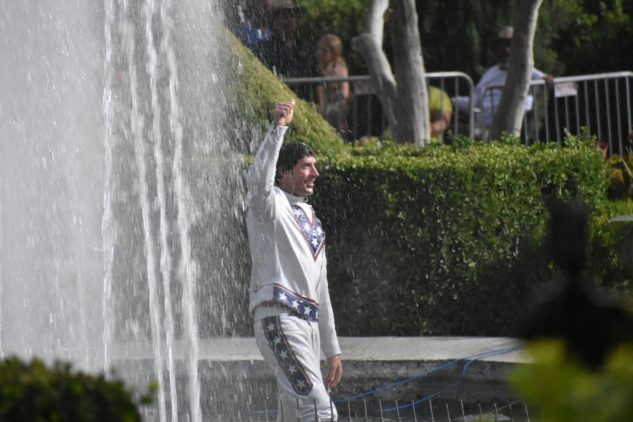 Travis jumped over and then in the fountain to cool off and celebrate his accomplishment. Travis with his wife Lyn-Z and daughters Addy and Bristol. 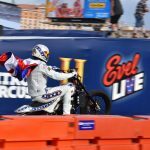 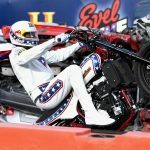 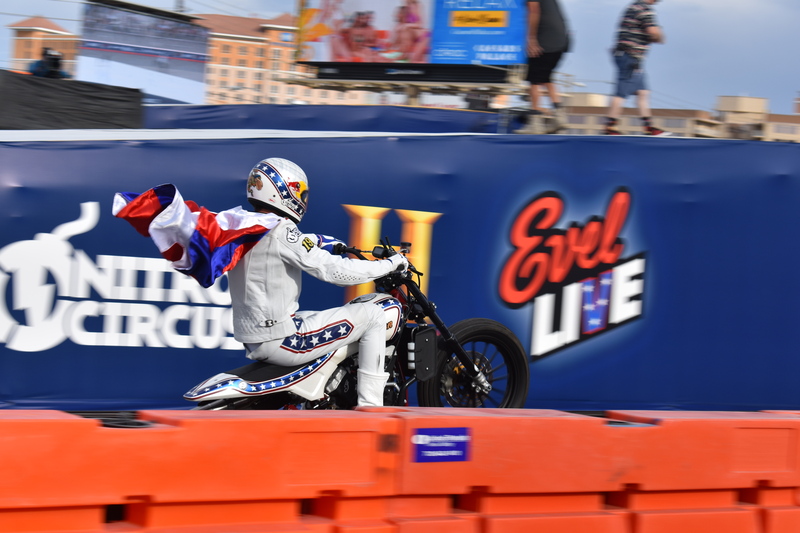 For anyone out there who wants to downplay Travis’ accomplishments this past weekend, saying how Evel did it on inferior machinery 50 years ago, we happily invite, no, encourage you to put yourself in his shoes and do the same. 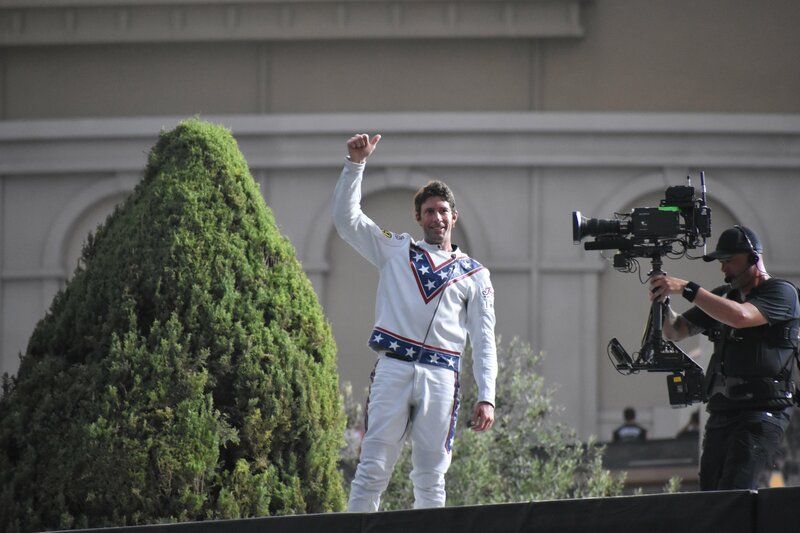 The internet will thank you. 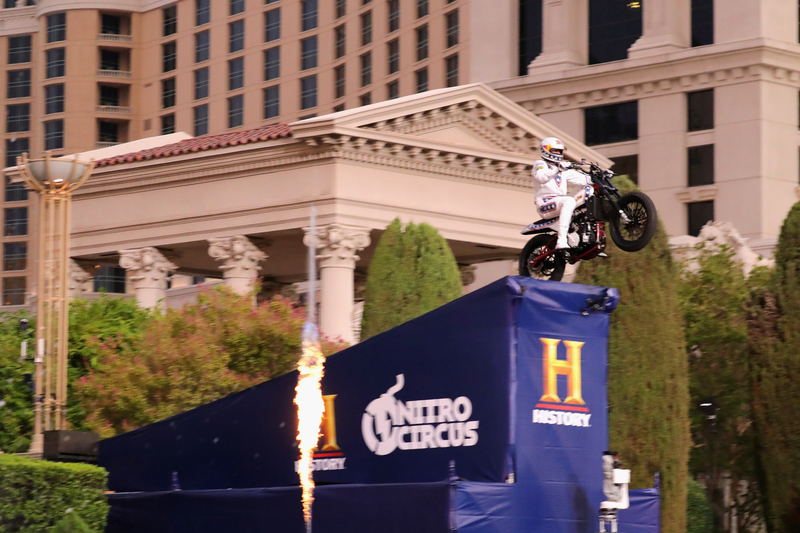 Hell, kick it up a notch and go even bigger, but don’t forget to send us a link to the YouTube video. 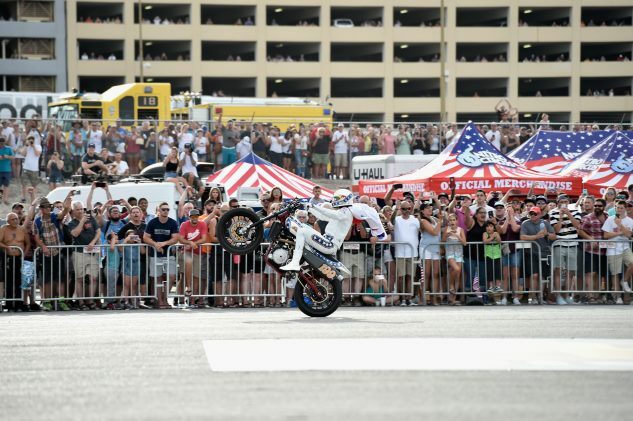 Then you, too, can make your mark in the motorcycling world record book. 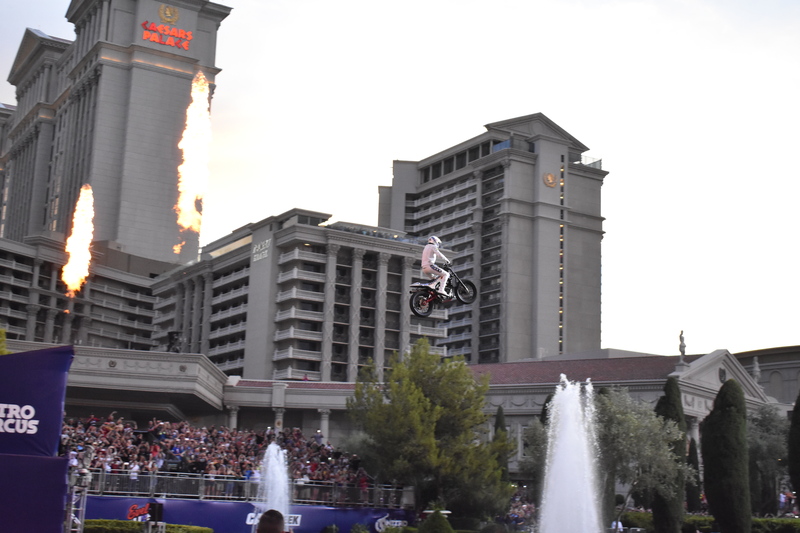 For those of you who missed it, below are videos and a gallery of all three jumps. 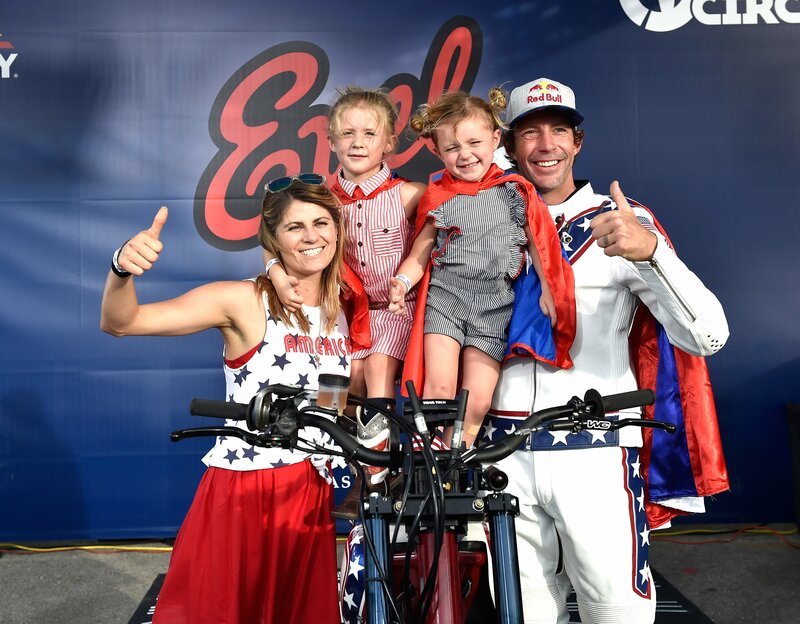 Enjoy, and congrats Travis!